Enactus United States competitions are challenging, team-oriented events that create a sense of accountability and motivation for teams to continually improve the quality of their projects. They also provide an opportunity for collaboration and best-practice sharing, further strengthening the value of the learning experience and the overall effectiveness of the program. In the United States, the 2019 National Exposition will be held in Kansas City, Missouri on May 5-7, 2019. 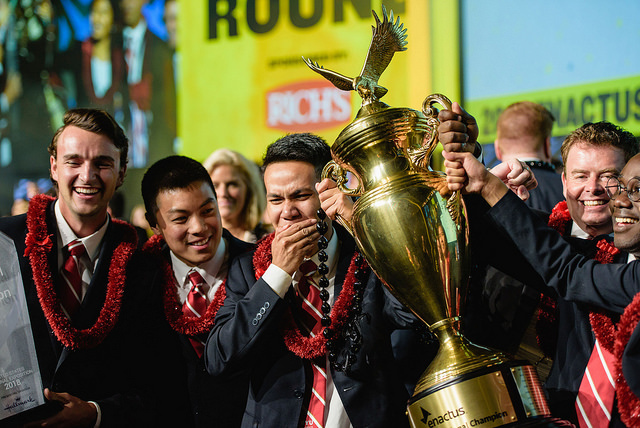 After two days of activities progressing through the opening, semi-final and final rounds of competitions, one team will be named the Enactus United States National Champion and be invited to represent the United States at the Enactus World Cup. Beyond the experience of the competition, these unique events are full of opportunities for networking, collaboration and best-practice sharing. Enactus United States partner companies have the opportunity to recruit future talent through career fairs held in conjunction with the competitions and participate in special events, such as the Top to Top Forum and Top to Future-Top Forum, which provide additional opportunities for mentorship and idea exchange.